She would put on a burkha every morning so that choto chacha, my dad’s younger brother, could drop her off at her parents. He would take her to her college instead. That was how Quazi Anwara Monsur graduated. 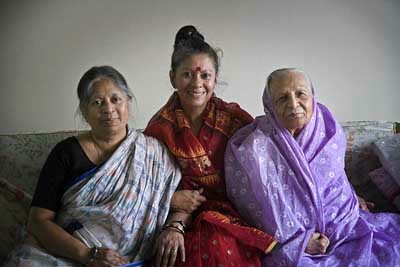 Dadi didn’t want her daughter-in-law to be getting an education, but Amma had the full support of Abba, my father. 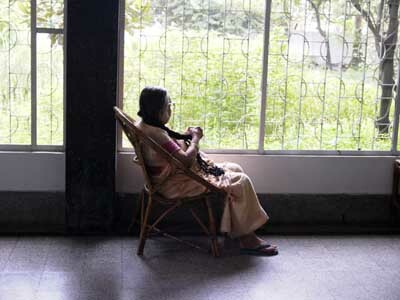 Her in-laws probably knew what was going on, but as long as Dadi’s authority was not directly challenged, Amma was quietly allowed to complete her studies. Amma had made a mark upon her arrival from Kolkata to her in-laws in Faridpur. Word had gotten round that Monsur’s wife knew how to shoot a gun. She had many other skills too, and being a school teacher was also able to support the family. When Phupuabba (my father’s brother-in-law) died, the orphans were split up. Bhaijan and Rubi Bu came to live with us. Only my sister had been born then, and overnight a one child family became a three child family. They were difficult times. 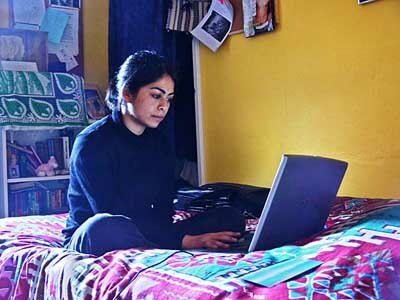 The family had come over to flee the riots in Kolkata and my father’s low paid government salary was simply not enough. Particularly as Abba and Amma insisted that all the children should have a good education. Amma’s teaching job, plus the extra income she made from marking exam papers wasn’t enough to keep the family going. She would buy wool from the market and knit sweaters to sell for extra income. Later Khaled Bhai was born and no other children were planned. In Amma’s words, I was an “accident.” Dadi, who had always been against her daughters-in-law going to work, saw the value of what Amma was doing and later it was Amma she used as an example to encourage her other daughters-in-law to get jobs. 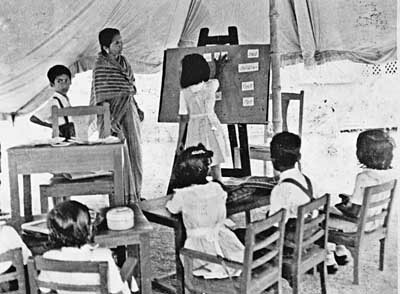 Once they moved to Dhaka, Amma wanted to setup a school in Azimpur colony. No one was supportive, but that never stopped her. Buying a tent from Rafique Bhai for ten taka, she pitched it in the middle of Azimpur playground and set up Azimpur Kindergarten. Later, in its new name of Agrani Balika Biddalaya, the school and the college went on to become one of the finest educational institutions for girls in the country. New classrooms grew alongside the tent. There was a large classroom “The Pavilion” which even had brick walls. When a storm in sixties blew away the bamboo classrooms, Amma sat crying in the mud floor that remained. A guardian saw her from the veranda of their house and came over to comfort her. “Do you think it is only your school” he had said. “It belongs to all of us, and we’ll rebuild it.” They did. The guardians and the teachers and the children had organized cultural shows and other fund raisers. This time they were determined there were to be no more bamboo walls. Each classroom had a tin roof but the walls were made of bricks. Many years later, Amma felt she needed qualifications in psychology to run her school better. She managed to get herself a scholarship to go to Indiana University, and eventually got herself a PhD in child psychology. That was the nature of the woman. Less than five feet tall, once this diminutive woman had decided on something, there was little that could stop her. This did not always make it easy on her children. Her standards were high, and those who failed to meet them, or like my brother Khaled, who felt there were other things to life, felt the brunt of her wrath. The dedicated teacher was not always the compassionate mother. Her public contributions won her the Rokeya Padak, a state award, but with the death of her son Amma paid a terrible price. The night before he took his life Khaled Bhai told me, “I am making things easier for you.” I had not understood the implications then. I was 14, he had just turned 21. It was a price we all paid. His death had mellowed Amma, and I got away with much that my brother would have been chastised for. Having lost one son, she became hugely protective of the other. After the 1971 war, Amma and I went over to Kolkata to smuggle my sister and her family out of the country. 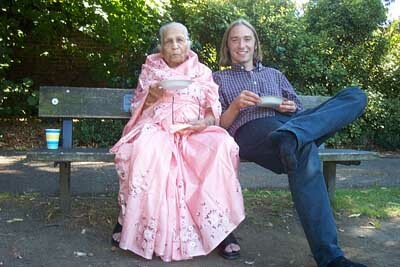 It was my first taste of India and Amma and I used the opportunity well. Kolkata was the cultural capital of India and we would see three films a day, and the occasional play. On our return to a free but unsettled Bangladesh, we found things were dangerous, and there were no set rules. Once, when I needed to negotiate with some hijackers who had stolen our car, this tiny woman insisted she would stay with me and be my bodyguard. Her protectiveness had its own problems, and as an adult, when I rejected her choice of a homely bride and found a partner of my own, she did all in her power to break up our love. Rahnuma and I stuck together despite it. Though Amma later relented, our relationship had been severely tested, and came precariously close to breaking point. Amma was strong and feisty, and didn’t take being challenged too lightly. Plucky, headstrong, and hugely energetic, she nurtured whatever she loved with a passion. Till she was 80, she would go to college everyday, ensuring that it ran smoothly. I had gone to UCLA for the Regents Lecture. It was in LA that I got Rahnuma’s message that Amma had been taken to hospital. 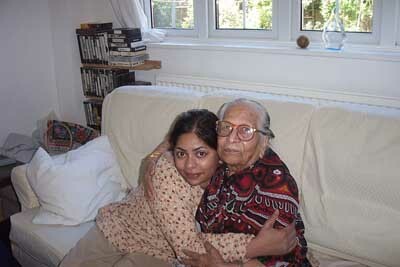 Apamoni, the ever dutiful daughter, now a retired doctor in London, had rushed to Dhaka to nurse her. She told me that things were stable, and I needn’t hurry back. I went on to Florence where I was conducting a seminar. Rahnuma’s second message said Amma was slipping. It was a very long flight back. My nieces Mowli and Sofia got a last minute Emirates flight and we met up in Dubai. An hour’s delay at the airport, the delay at the luggage belt on reaching home and the rush hour traffic became unbearable as we wondered whether we would see her alive. Amma wasn’t going to give up that easily. She wanted us around, and her face glowed as she saw the three of us. Fariha, my youngest niece, arrived the next day. My nieces got out the family album, and through the pain, she peered through the photographs. As she looked at a picture of me, Fariha asked “Who are you looking at?” The face broke into a smile. Frail, but distinctly a smile. It is wonderful how the tiniest of movements transforms a face. She whispered my nickname “Zahed”. Later as she strained to lift her hand to stroke me, Fariha joked, “Grandma, pull his beard.” Another smile and a whisper, “Beard?” Later when she stroked me again, Fariha repeated her joke. Another impish smile and the word “Pull?” Those were the last three words she ever spoke. Apamoni had toiled ceaselessly to take care of her. Rahnuma had run ragged with errands, her grandaughters stayed up all night giving her water, changing her clothes, checking the oxygen pressure, coaxing her to eat and put on the nebuliser. Hameeda and Zohra both knew Amma well. They bathed her, combed her hair and nursed her, trying to interpret every gesture. Delower, whom Amma saw as a son, was omnipresent and kept the ship from sinking. Dulabhai, my brother-in-law, also a retired doctor, kept vigil from afar. But it was me that she longed for. This was not the time to dwell on patriarchal politics. I was losing a person who loved me beyond reason. With all my traveling, I had always wondered where I might be, when the time came. I needn’t have worried. Amma waited till I returned. After many rainy days, with Chittagong in a deluge, the sun shone through this morning. Amma didn’t like 13. Saturdays were bad. Thursday was the best day of the week. At 8 this morning, Thursday, the 14th June, carefully sidestepping a 13 and a Saturday, with the sun glistening on her favourite champa tree, Amma chose to say goodbye. She was 83. In those last few days, I saw my mother in a way I hadn’t before. I knew the softness of her skin, every little mark on her face, the shape of her tiny feet, the wrinkles on her fingers. As I carried her to the wheelchair, or moved her up the bed, I felt her weight against my body. I knew how it felt to be lovingly stroked by a hand that had barely the strength to move. 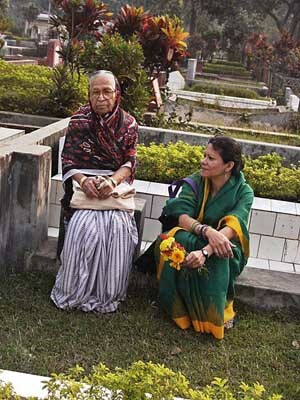 Her janaja was at the Takwa Masjid in Dhanmondi. My colleagues at Drik and Pathshala, our Out of Focus children did all that was needed. They would have borne my grief if they could. Many years ago, I had stood in the same mosque during Abba’s janaja, on an Eid day. We then went to her school. As the long line of students, teachers and well wishers from all over Azimpur walked past to take one last look at their beloved Boro Apa (big sister), I walked across to the classroom where I had studied. Through my tears, the benches and tables looked tiny now. Sitting on the bench and looking up at the blackboard I could hear Boro Apa’s footsteps on the corridor. The grave in the New Azimpur Graveyard, had been bought in 1970, when Khaled Bhai had died. We had then bought three plots, for Amma, Abba and Khaled Bhai. The plot in the centre had been empty. I lowered Amma into the grave. She herself had bought the shroud and had it washed with Aab e Zam Zam, the holy water from Mecca, in preparation for this moment. The white shroud glistened against the dark clay. Our relatives and friends, Ammas students spanning sixty odd years, my own students and Amma’s numerous admirers were there. They carried the wooden Khatia, lit the incense, scattered rose water. They shared our loss. I remembered the finality of the knot at the ends that I myself had tied. Neat rows of bamboo stakes were placed diagonally across the grave, shielding her body from the earth that was going to cover her. Bamboo mats were folded over the stakes that sealed her in. Then we all took turns to cover her with earth. After the munajat (prayers), as I walked away, I imagined my mother in between her husband and her elder son, reunited in death. I could hear them calling out to me ever so lovingly. “Zahed”. I can touch your feeling bhaiya….The last day i wasn’t there but after reading your article this, i can feel 14 jun i was there. particularly in the field of education. May she be blessed in heaven . links you to your mother. in Washington and has been working here since June 2001.
please mail your phone number . You have Barbara and my deepest sympathies. I’m very sorry for your loss. written a beautiful and true testament to your mother. Although I read all your messages – I have been remiss in not writing back. your acknowledgment of your love and your loss – have moved me deeply. And hope too that your work is going well. narrative you wrote to tell us of it. Best of luck in coming to terms with being an orphan. since she was a baby. To be, honest, she is still a baby for me. Keep up the good work. You are an inspiration to many, including myself. but that won’t lessen it. end. You have my deepest condolences. unsentimental) tribute to an amazing woman. time on the book I started before we left Bangladesh. to say, it is Bangladesh that captured my heart. It really moistens our eyes. I myself have lost both my parents at a comparatively younger age! So I do understand the pain. I pray solemnly for her soul to be laid in eternal peace. Its a very sad news the She is passawaya. We all loss a motherly person. I was in Agrani School long befor for only few days, I got her blessings. After became a photographer again i got her wish few times. I can not tell you more. Nobody can tell anything to a son who lost Mother. May Allah be kind to her. What a beautiful piece of writing. I enjoyed every word and could feel the emotions. the pain of this loss. I am sure all her good memories with you will keep you happy and lead the way. I am praying to Allah for the salvation and peace of her soul. hardwork in setting up one of the best schools in the country for girls. will also live in the achievements of her worthy son. soul rest in peace. Ami Bytes for all o ekta message korbo. sure you have the strength to withstand the grief. sessions in DRIK as well. Presently I am in Canberra for doctoral research. drops to a person who for genuine reasons has forgot to weep beyond own loss. to take over. Your mother’s is such a one. rewarded generously in the life after. who took time to read it. I alway called you mom Auntie. She was sucha great and loving person. she favoured her relatives. As I received the prize I still remember her smile. longer God willing next time. the peace of your mother’s soul. Please accept my heartfelt condolences. You’re a brave man, and to be able to write something of this sort at this point in time is truly admirable. The article pays proper homage to my grandmother’s remarkable twin sister, and rightfully expresses the obstacles she gracefully overcame in her exemplary life. I showed this to Amma and the article and accompanying images promptly flooded her mind with memories of your mother and father which she proceeded to share in vivid detail with me over an hour or so. Inshallah this has helped me to remember that if I had but a fraction of the drive or character of my parents and grandparents, my path in life would be distinct and righteous. I wish you the best and may your parents’ souls rest in peace inshallah. simply beautiful and moving Shahid. Wonderful! Bravo! pray for her soul to rest in piece. groomed man. Now I know where it all comes from. education. I was touched by the vision of the man. instead of rifles, they had flowers in their hands. will continue to inspire generations to come. your write-up I simply could not hold my tears!!!! finally she finds a place in “Jannat-E-Ferdous”. cover the short fall due to physical absence of ‘Bara Apa’. My sincere condolences at the sad loss of Ranu Khala. She was such a remarkable person. the contents thinking it was a journalistic piece that i would read later. incredible woman and now i understand where you got your genes from. We love you very much, take care of yourself. Lots of love, please accept Akeel and my condolences. Amar shomobedona roilo…apnader kotha bhabhchi amra. goto februarer26 tarekhe ame amar abba k hareache. tarporo cholte hoy….k jano bolechilo…..
shey manushte mritu boron kore, tokhon manushte hashe prithebe kade. I’m very poor in my ability to express and find no word to console you. Instead, I’m very touched by the way you expressed your shocks. I lost my parents too and I’m aware of the pains and losses. Very personal regards to you. ago: sadly I was not there but in Pakistan. I do enjoy being on your mailing list. khala very well. Now it is the fact that Khala is gone and gone for ever. will be with you even if she is not beside you physically. rest of the family will bear this grievous loss with courage and fortitude. and thanks for a beautiful story. 80. They sure don’t make ’em that way any more. busy life. May you find the strength to bear the pain of your loss. My heartfelt condolences. May you find strength and peace. your family members enough strength to bear this loss. Please accept our sicere condolences on the sad demise of your mother. young boys and girls with the light of knowledge. As member of Service Civil International (SCI), we have had many occasions where we used to receive love, affection and guidance from our respected Apa (Quazi Anwara Monsur). We still remember those good days from her the then residence at outer circular road, Magbazar when she was the tresurer of Service Civil International-Bangladesh where we used to receive her affection, guidance, support, whenever needed. On the eve of her sad demise, we pray for peace of her departed soul. May God rest her in iternal Peace. We also pray to the almighty to give you strength so that you can sustain the greatest loss of your family. Thank you for that moving tribute. No matter how old parents are and no matter how prepared one is that they will leave one day, one is really never prepared. My deepest sympathies. Amar o amader pakshya theke apnake o apnar paribarer sokarta sobaike antorik somobedona. Amar khub dukhkho hochchhe je ami gotokaler age jante parini Ma chole gechhen. Gotkal ami phone korechhilam eta dhore niye je apni ager porikolpona moto Kushtia gieyechhen kintu pore Anis shaheber kachhe janlam Ma ar nei. Zahok eta bastob, ami bishwas kori apni apnar probol manoshik shokti diye shok katiye uthben. ‘Sarbe satta sukhita hontu sarbe satta niramaya’. You have had a GOD’S GIFT. Your Amma must have been a satisfied person for her achievements. Sorry for your loss. Our thoughts and prayers are with you during this difficult time. i feel deeply sorry for you. your mother was the principal of the school i went to. she didn’t actually teach our class. but she was one of those rare personalities who fill the space surrounding them with a warm and quiet presence. even though i was always too shy to go and tell her how much i admire ner, maybe she can hear me now, now that she is in heaven. Sincere condolences from myself and also on behalf of my family. She sounds like a great woman. Love and wishes to you. Deeply sorry to hear the passing of Amma. I am relieved that you were able to reach Dhaka on time to see her before the end. Please accept both Syeda and my sincerest sympathies and condolences. Our love to Rahnuma and your sister and other members of your family. We are in Chicago visiting family and will write to you afyer we return to LA. I am sorry to hear of the loss of your mother. Your tribute shares with us who didn’t know her what an inspiring woman she was and her memory will give light to the future. Thank you for sharing her life with us. A very loving tribute. Your mother was certainly strong, protective, and obviously loved you. You are lucky to have experienced so many years with her and to be with her on that last sunlit day. Thanks for letting us know about your return and this important turning point in your life. We met briefly several years ago at a conference in Malaysia. We shared a drink together with another women, a colleague/friend of yours I believe. I was attending as a staff person with IMPACS a nonprofit in Vancouver, BC, Canada. Attached is a picture of my young daughter and I in case that helps you remember. Over the years I have cont’d to receive your emails. I’m writing to share my sympathy at your mother’s passing. Your words are very moving. Ah, the pain and the beauty of love, family, living. This is the most beautiful and loving obituary I’ve read. Straight from the heart, a tribute to a great woman, mother of us all. i had kept this to read later and finally decided to read it while having my lunch today. i am so sorry to hear of your mother’s passing. i had of course never met her yet your words made my eyes most, having lost my father when i was 18 i got transported to that very sad period of my life. this is a very difficult time for you and i dont expect a reply. just know that someone who considers you a friend will be thinking of you. take care of yourself shahid. u will need a lot of time and that is the only cure – not to forget but for the grief to lessen and acceptance to set in. It is truly courageous of you to have written this. really was a tough woman. be rich, and others not so much. Lyndall has told us the sad news about your mother – I am so, so sorry and wanted to send you my deepest sympathy and condolences. I have read, in tears, what you have written and she was obviously an extraordinary lady who loved you with all her heart. My own parents have both passed away and I truly believe that they choose their time when they have done and said all that wanted to, as your mother did. I am so sorry to hear of your great loss – If you were here – I would hug you and kiss you on both cheeks and say I wish you a long life , this is always said to the bereaved by Jewish people to those who are left behind, who in the midst of pain and loss, must continue to embrace life. Your beautiful honest and moving account of your Mother, was a privilege to share and my thoughts are with all your family at this sad time. Your Mothers strength kept her going till you returned to her, and I give thanks that you could share her last moments with your family and loved ones. Please do not worry about your visit, all other things can wait for now. I cannot tell you how deeply touched I was to read your tribute. What a life! What it must have been to be so close, to have so much between you! Allah khalamma k Beheste nasib karun, amin! I was very sad to learn that your mother passed away on 14th June. I read your musing twice and was thinking how lucky you were to have jsut an amazing woman for a mother. June is also the month that took both my parents away from me/us. I lost my father on 13th and mother on 18th June 1998. The loss is not something I overcame or accepted but learnt to live with. I refuse to think my parents are gone, especially my mother, so I reach out to her in many ways. I hope you have the strength to bear this loss and can reach out to her. I am back in Dhaka and will come and see you when it is convinient to you. 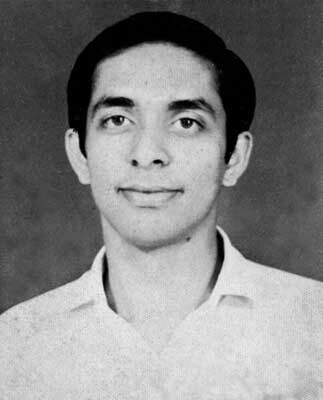 Dear Shahidul – very moving & a fitting tribute . . .
To bid farewell to Bobby – devoted husband to Marjorie, a generous father, the ‘funnest’ of grandfathers (as one of our children so fondly described him), elder brother and, to so many, a good friend. Over the last ten days Marjorie has received many thoughtful letters of condolence and tributes, and I would like to read two to you which provide some measure of the man. The first is from John Mardon, a school chum from Barking Abbey days in the 1930’s . . . .
My father, or ‘daddy’ as he preferred to be called, was a man of extraordinary self will and great courage – none more so than in these last two difficult years of his life whilst fighting cancer. He was a man who demanded the highest of standards – standards which, unfortunately for those of us closest to him, we rarely met. However, my fondest memories of Bobby are of a man who was at his best in good company, with his quick wit & humour and seemingly endless number of stories from a long, active and interesting life – it is for this, as in so many other things, that Bobby will be sorely missed. In contrast my father was a very private man, modest in his achievements and never one to burden others with his troubles, pain or fears. And so, in closing, I would like to read to you a poem which I discovered last week amongst his papers, a poem that he wrote during these last two years and which was published in a local anthology called ‘Songs in the Silence’ (United Press Ltd. East Anglian Edition ISBN 1-902803-15-9). Of sea-wreck, shells and sweet samphire. Searching out every creek and cranny of the mind. . . . . and to think I did not hear of this until after he had left us! Prithibite olpo kichu manush tahke jara ter kajer modhe beche theke, amader ridoye beche theke. Khalamma tader modhe onnotomo. shokal belai Amin er phone, Alam bhai er ma mara gachen.uni osusto chelen ami jantam na, ami janlei ba ki hoto. ses bedai er jonno motorcycle neya chutlam Drik-a. ses jatrar kichu chobi nerobe tulte thaklam. Moti bollo,” das hajar taka (10,000) deya wheel chair kena hoyachelo kinto khalama sai chai ar babohar kora holo na. Shahidul alam tar ma,r Lash(dead body) khadha neya bareya aslen drik thake. Khalammar ai bareya asa choro din er jonno ar kono din ferben na Drik-a. I have had a very hectic week and have only just managed to read your blog. Your post about your mother’s demise made me feel so sad. I wish there was something I could do to make it easier for you. There was a time I used to tell friends who lost a parent that I couldn’t possibly relate to how they felt because no-one could possibly imagine the pain of losing someone as special as a father or mother. I no longer say that. My mother passed away just over 4 years ago and although I was fortunate enough to be with her every moment of her last days in hospital, I can still remember how completely alone I felt when she died. No-one gives you the kind of unconditional love that a mother does. My mother was such a sweet and special person. She was there for us at every stage of our lives offering solace, celebrating our successes, sharing our joys and shedding tears and offering support when she saw us in pain or anguish. Even with the passage of time there isn’t a single thing that happens in my life that doesn’t bring her to mind. She continues to live in my heart and she always will. Reading your account of your mother’s life and the special moments you shared prior to her death, shows me what a special and accomplished woman she was and how proud you were of her. The heartbreak of losing her must be tearing away at you. All I can say is try and celebrate her life and that will perhaps make it a little easier to bear her death. 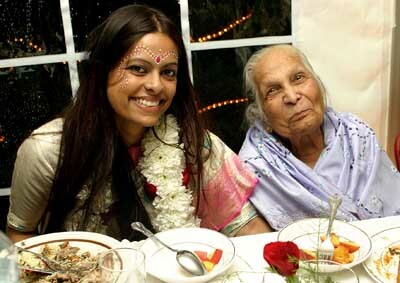 When I am at my lowest, I try and remember the good times I had with my mother – and there were many. I try to remember the jokes we shared, the stories we exchanged, the discussions we had, the special moments that brought us closer and kept us close. These thoughts bring to mind her happy and peaceful face and it makes me smile and gives me some peace. My thoughts are with you at this difficult time in your life. You are a wonderful caring person and your mother must have been so proud to have a son who made a difference in the lives of so many people around him. She will continue to live in you and in the people she helped through her work. I never read such a great tribute by a Bengali son to her mother. I ralmost cried reading The Last Goodbye. Please accept my heartfelt condolences on the loss of your mother. Your essay about her loss was touching and warm — a suited tribute to a mother’s love. She would be proud and pleased to have read it. Inna lillahe wa inna elahey rajeoon! Please accept my condolences on the sad and (always) untimely demise of your beloved mother. And may God give you (all) patience and fortitude to endure the loss. 14 tarikh ratey Khalamma’r dehanter khobor pai. Dhaka theke phone kore janan ekjon. 02 June apnar jonmodiner porei ekta shubhechchha-barta pathanor kotha mathai chhilo. hoye otheni. khanikta apnar byastotar kotha bhebe. khanikta amar internet option prai nei bollei chole shejonno. er modhye ei khobor peye apnake likhtei chaichhilam. kintu konorokom bhasha khuje paowa duruho chhilo. er modhye worldpress network-e apnar lekhata email-e pelam. Khalamma ke niye lekha. onek rokom tukro smriti nara dichche. asha kori apni shob kichhu shamle niye nijer kajer modhye achhen. jemon ta chhilen eto gulo bochhor. I would like to recall the services offered by Principal Anwara Manur at Azimpur Kindergarten School to use Veranda and courtyard during holidays for Azimpur Kachi-Kanchar Mela. It was my pleasure to include her in the advisory board of the Kachi-Kanchar Mela.From this Mela Papya Sarwar, renowned Rabindra Sangeet Shipi and Abdus Salam, presently Chief Architect of the government of Bangladesh, came out. Both of them were budding artists in 1962. Last I saw Anwara Mansur as Chairman of Shishu Academy. Possibly I met you at Drik some time in 90’s. I am deeply saddened and shocked to hear the death of Anwara Mansur. May Allah grant her peace on the departed soul? My prayers are with the members of Anwara Mansur’s family. I’m so sorry to hear about your mother. I remember meeting her at one of our board meetings in Colombo — she was such fun and such a spirited lady! You will miss her immensely, but I guess all of us have to face this someday even if it doesn’t make it any easier. My deepest condolences to you and your family…. tell you how deeply I sympathise with you in your great loss. I’m very touched by your words. Your mother was a very important person and it’s certain that she has left a lot behind. I would like to express my deepest condolence to you. Shahidu….Oh I am so very sorry ..i wrote to you yesterday without reading the contents..something made me write to you when I saw your name..put aside the contents thinking it was a journalistic piece that i would read later. I just went through your heart wrenching account of what you experienced, wept reading at the most beautifully expressed piece..full of love, your grief and pain pouring from every word. Your mother sounds like an incredible woman and now i understand where you got your genes from. I finished reading the piece about your mother and I am still crying while I write to you. It reminded me of my mother who died on May 01, 2004. Thank you for making us aware what a great lady your mother was. I have seen your mother on several occasions and once or twice I had a chance to talk to her. I am very much moved by your description and it took me to my own memory lane….. Please except my heart-full condolence. Your Shahidulnews just reached my hand.My condolences to you and to your family members.We knew how much your mother ment to you. informed that her Namaz-E- Zanaza is going to be held with in 45 munites.I rushed though Dhanmondi Mosque but could not join her Zanaja as it already been performed before my arrival. a strong women at the age of 89 .Her thoughts and beliefs ware a clear sign of that. Thank you & take care. I only just heard about the loss. And this is a very touching tribute. When the memories are so rich, no one truly leaves. I was very moved by this. You have been much in our thoughts and prayers over the past few days. My deepest condolences. May God give you and your family the strength to withstand this loss. i wish every son can love his mother this much. 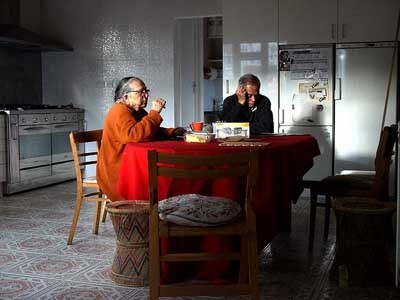 Boro dadi was the mother figure baba had since Rubi fuppi and he moved in with boro dada and dadi. With 4 younger siblings, he was only 10 years old then. Most of baba’s childhood stories I have heard are from the times he was living with Dipu fuppi, Khaled chacha, Rubi fuppi and you. 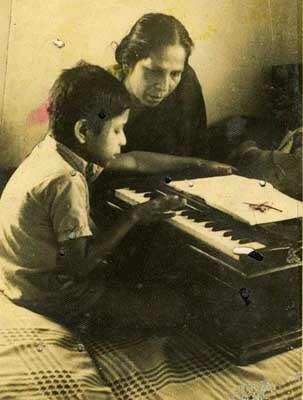 Boro dadi was also the closest mother-in-law figure amma had. I remember the ritual of going to meet boro dada and dadi every Friday morning with baba, when I was in school. Every body I know who have been nurtured at boro dadi’s household are remarkable human beings. Her memories and inspiration remain within all her children, grandchildren, and numerous lives she helped. 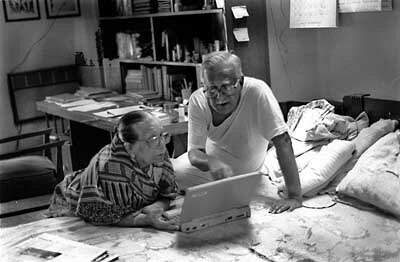 So many of my childhood and teen age memories are associated with Boro Dada/Dadi and their’s and your homes. And all those memories are good memories. Thank you all for your love and the time you spent with us. Many of my cousins were afraid of Dadi- afraid if they wore some fancy dress/makeup/high hills! I never heard one harsh word from her. I think somehow she treated me special. When I got admitted to BUET, she gave me one of her own jewelry, a very nice, 1/2 cm thick gold chain, with design that we dont see any more. I have that chain with me, and each time I wear/see it, I fondly remember Dadi. Boro Dada/Dadi will always be part of me. I hope and pray that their good souls find eternal peace. apnar post porar por amar ma-yer kotha monay porlo. We are deeply sorry to hear the passing of your Amma. Please accept our sympathy and condolences.Our love to other members of your family. Gabriel Garcia Marquez used to say this for those who had passed away during out lifetimes. “Do not cry because they have gone, be happy because they were here.” Never before has this quote been better used. I’m very sorry to learn about your irreplacable loss. She had been a remarkable lady. Through your beautiful story, I now learned so much more about her. May Almighty bless her and she rests in peace. I know my condolence is coming rather late, June’s away, she usually updates me how you’re doing. It’s been sometime since I last you, I hope you’re doing well. Just to send my best wishes to you, your sister and your family. It is wonderful to read your mother’s life story again, having heard it from her, and also having enjoyed her company not only at DRIK but also in the airport on our return back to UK after Chobi Mela 3. I only met her when she was older, but I thought your mother was rather remarkable – no doubt obstinate and determined, but those are often good qualities (especially in patriarchal cultures). I can see her now, entertaining me to tea in her bedroom – all that you had left her of her house as everywhere else was (is?) full of young photographers, exhibitions and enthusiasts. Oddly, your email got caught as bulk mail, which I check from time-to-time, but had not done so for a couple of weeks. Hence, of course, my email a couple of days ago re. the Dublin conference. I wasn”t being insensitive, I simply didn’t know. Perhaps you have had to withdraw; or perhaps you are going on with everything as usual….would that be what your mother would have done? Anyhow, this is really to wish you and Rahnuma well. Perhaps Rahnuma would email me to let me know how you all are – assuming that you are as busy as usual. feel. bhalo thakish, onek ador nish. ruma. her in peace in eternity and strengthened you to endure the grief. I thought upon my own mother who approaches her 80th year – every day a little more frail – I am in Dhaka mid December to see her, lets try to catch up. ses bar 3bochor age Italy jawar age dadur sathe kotha bolte perechilam.3bochor por ese dadur mukhta ontoto dekhte perecilam.aj taro sujok nai.aj dadur baranday gie khub kosto lagcilo. aj vison mone porce 95 saler dike hortaler din ami falan mirpur theke hete Dhanmondi asi.pore dadu amader Anaros r bual mach-er torkari die vat khaycilo.ahh.. ki moja ajo mukhe lege ache se sadh. It made me very sad to read your news. I had so much respect for your mother, one would wish that such a person would live for ever, providing her strength and example to the world at large. I am sure that much in you comes from her strength and vision, in that way you are like a living homage to her as well. I will share your blog with some of the friends you made in Mexico. I am sure they will want to read it. Your pictures are in the form of written words. Please let me know if you received this, I have indeed written to you several times. the tenderness the love the understanding who your mother was the realism. and feeds the soul… there are not enough Shahidul’s in our world. I have been too busy to read your wonderful news e-mails. But Rahnuma told me about your mother, and sent me your moving piece about her. Oh Zahed, it must be very difficult — and deeply sad. I am so sorry and we are sending you love and big HUGS from Canada. I still have both my parents, and cannot imagine how hard it must be. Mary still struggles with her mother’s death. Sigh. We moved to Ottawa a few weeks ago. Do you ever come here? When will we see you? We’ll be in Ithaca NY Jan to May. Sending LOVE and commiserations and kisses like the little tiny white “forget me nots” that grow by our dock on our tiny clean fresh lake (with many happy turtles and fish and loons). Being a recent recipient of ShaidulNews, I was browsing through the Drik site and was marvelling at the drive, energy and vision behind Drik. Reading this beautiful tender tribute to your mother, it made perfect sense. There is no doubt that her spirit lives on. My deepest sympathies on your loss. You probably do not remember me – we met, rather briefly in Colombo a GKP meeting last year. My deepest condolences to you and to your family, The tribute you wrote to your mother brought tears to my eyes, She is an inspiring personality who has changed countless lives for better people like her live for ever as all those who she touched and inspired will follow her footprints to keep her alive in their hearts for ever. It was by mere accident that i came onto this page but after looking at the beautiful photography i felt compelled to read the story that captioned these memories. I cannot explain to you how deeply touched and moved i am – beyond words. I found myself mourning for a women i have never met, and that my friend, is very special indeed. From someone of Bengali decent, born and brought up in the West i find that the more i grow older the more i want to learn about my past, and my family’s past. Although you are not my family (i don’t think?) I have felt a deep connection to your story. You are a very gifted writer. I encourage you to continue this. May Amma rest in heaven and i pray that Allah protects her, your beloved Abba and Khaled Bhai. I am an x-agrani girl and I miss her sooo much.. I am deeply touched by this news. She was my inspiration as a little girl to this date. May Allah rest her in peace. I read your blog only today, while searching for Rahnuma Ahmed. I am proud to be an Agrani girl. Even more proud to know Boro Apa and Tulu Apa. They have always been a source of inspiration for me. Agrani balika Biddyalaya has been my solitude for a very long time. While studying in DMC, whenever I felt despair, I used to go to school to meet my teachers , to have a glimpse of Boro Apa or Tulu apa. After a certain time I realized that they were changing. I selfishly wanted them to be the same image I had of them in my mind.The more I found them to become old, the more lost I seemed to be. The thought dawned that someday they wouldn’t be there. I was afraid. I could not bear the thought , how could I handle the truth? How did you handle the loss? I am sorry. azimpur kindergarten ! may god bless her and I am sure god surely will . I did my first 4 years of my life at azimpur kindergarten. teacher in medical college life ! our guard bhudda with silver hair ! After my MBBS from DMC , 1982 left Dacca the same year and since then residing here in Oslo , Norway ! 28 years ! mother who was our great teacher with so much love and affection for all of us . Her dedication to our nation would be there for ever . Boro Apa’s. She is an inspiring personality. I am an x-agrani student who spend my whole school year in Agrani (1989). I still remember her smiling face. In 1986 my younger sister had burned she was so kind that she went to see my sister in Holyfamily Hospital and we all student made a prayer in schoolyard. I am proud to be an Agrani girl. May Allah peace upon her. May Allah bless her with Jannat-ul-Ferdous! She was our Boro Apa and we always respected her for her integrity and dedication for the school and it’s students. I didn’t know many of her personal stories, shocked to hear the death of her son at such an early age – I can not imagine how she went through this trauma! Thanks for sharing it, our heartfelt sympathy for you and your family for the loss.